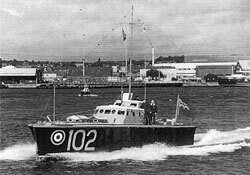 HSL 102 was one of the RAF 100 class High Speed Launches which joined the RAF fleet in 1937 to increase the operational range duties of the 200 class seaplane tenders. 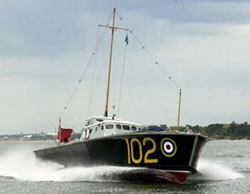 Built by The British Power Boat Company at Hythe, the 100 class HSLs were designed by Fred Cooper. The class were a stretched version of the 60ft MTB hull and the prototype was the format on which the RAF based their decision for a new type of high speed launch. The dimensions of the launch were 64ft loa with a beam of 14ft 6in, and powered by a trio of Power Napier Sea Lion engines. The range was 500 miles at a speed of 35 knots. The two wing engines were inclined to drive directly to the outboard propeller shafts whilst the centre engine faced the opposite direction and transmitted via a Vee-drive to the centre propeller. This arrangement allowed for "cruising" on the centre engine only, a range extending economy measure which retained a high degree of maneuverability. The accommodation included an Officer's wardroom / sickbay for four and forecastle bunks for eight crew. With target towing in mind, an after well was incorporated above the tiller mechanism, but this feature was deleted from later craft. The prototype, HSL 100, was launched in May 1936 and on trials surpassed all the parameters set by both the builders and the RAF. The Air Ministry immediately placed further orders, with HSLs 101-114 ordered in stages in 1936 with deliveries commencing in 1937. Two Further 100 class HSLs were ordered in 1938 with HSLs 117 to 132 ordered in 1939. In the event, production of this type ceased after HSL 121 when the remaining 11 craft scheduled for completion in 1941, were switched to the BPB Whaleback design.